Been a while I had eye twitching , and when I asked to my friend , he said that the eye twitching has meaning and sign . But I do not just believe it , because I found my eye twitch because something is wrong with my eye muscle nerve tissue . Once again I say that eye twitch not mean anything ( myth ) , but as a sign that the body is experiencing mild impairment . (Dr. Karen Wolfe , author of ' Create the Body Your Soul Desires ' ) . 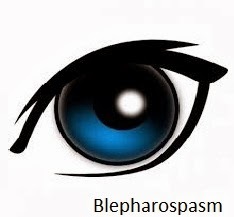 Twitch or medical term blepharospasm ( Beb ) is uncontrollable muscle contractions that cause contractions around the eyes . If you are constantly having eye twitch without stopping , it could be a symptom of a nervous breakdown . But , if only occasionally experienced , medically eye twitch could mean you 're under stress , lack of sleep , or too long looking in the same place for a long time ( eg , too long at a computer screen ) . Health experts agree , 99 % twitch of the eye caused by stress and fatigue wracked body . There is no other way that you can do to stop this other than a twitch of the eye and allow the body to rest your eyes . Before the problem is getting worse , you should begin to reduce stress levels , reduce the intake of coffee , and try to sleep at least 7 hours a day . According to some sources , there are at least 7 marks which cause eye twitching , while the mark I will describe below . Your eyes may be working too hard that trigger eyelid twitching . Strained eyes continued to stare at the computer because one of them being a very common cause of eye irritation . More than half of the elderly population experiencing dry eyes due to the aging process . Dry eye is also very common for people who use computers , take certain medications such as antihistamines , antidepressants , wearing contact lenses and consume caffeine or alcohol . Fatigue and stress can also lead to dry eyes . Lack of sleep is experienced either due to stress or other reasons can trigger eyelid spasms . Immediately pay your lack of sleep can help reduce twitch . Eye twitching can be one sign of stress due to the eye being so tense . Reducing stress can help make the eye stop twitching . Some reports indicate a lack of certain nutrients such as magnesium can trigger eyelid spasms . If you suspect malnutrition has affected health nutritionists should ask the opinion . People with eye allergies have symptoms such as itching , swelling and watery eyes . When the eyes are rubbed , will release histamine that triggers tears . Some evidence suggests that histamine can cause eyelid twitching . According Dr.Donny Istiantoro , Sp.M , eye specialist in Jakarta Eye Center , a twitch of the eye is not to worry about things . Because , it will usually heal itself . Due to disruption of motor nerve - 7 is simply due to too tired . For this case , can be overcome by the blood booster multivitamin or vitamin E.